It's crab cake and waffle time! Coffee isn't my thing, which is why I am probably the only person who would hit up a coffee truck/stall to try their food. I love a good food truck and their parks thus I frequent Spark Social SF near me quite often. On each occasion I walk by one of their permanent purveyors called SPRO Coffee. I notice they do serve food along with coffee and such, but the menu seems more light bites than meals whenever I'm there. Recently however, it was around lunch-ish time and I was on my way to work and wasn't looking for all that much. Perusing the offerings it struck me, why not continue on my unusual waffle journey this month and go a little off the ranch for some combo. Thus my unintended snack pairing of a crab cake and red velvet waffles. Now granted, they didn't come together like say chicken and waffles, though in SF I can't say it isn't out of the realm of possibility that someday it could become a thing since we are known for Dungeness crab and brunch spots that serve up waffles. Though, it would work better with a standard waffle instead of the sweet thing I went in for. Just saying, if anyone out there with a restaurant is reading and wants to try a new brunch delight, then why not crab cakes and waffles. If you can do it with fried chicken or even crab cakes benedict, waffles isn't much of a stretch. 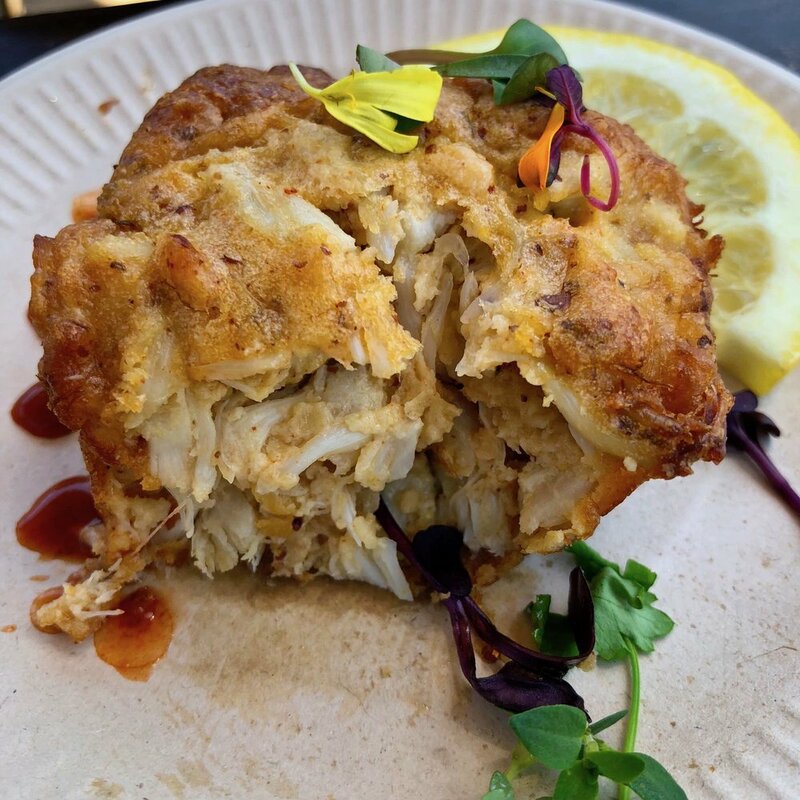 Actually it was a single creole crab cake shaped like a muffin and served up with a lemon wedge and drops of a spicy remoulade kind of thing for $5.75. When I asked about it the guy worked really hard to sell me on it and said it was chock full of crab and you couldn't find a single one in town for that price as usually they come in pairs for $15! Seemed like a bit of a hard sell when I was probably already gonna get it so I did nearly reconsider but got it anyway (obvi). It really wasn't the biggest of things and at most three bites. But you know, crab meat is pricey, especially when someone else has to do all the work to get to the meat. Kind of why I don't usually go in for a whole crab, too much work for too little meat. Well, for the size, it was mostly chunk crab meat you could actually taste. Though first bite without any sauce came across a little "fishy" tasting. More like an undertone which didn't seem quite right. Dipping it in the sauce actually helped in a couple ways. Covering up that taste (along with the lemon squeeze) and adding some flavor to this as the few drops on the plate had a nice little spice. Whatever mix they used with the crab had no real taste or creole seasoning as the menu describes. I mean, all in all it was okay, but I've had some better crab cakes around town. Let's be honest, these were the main reason I really stopped by this place. They call this the Southern Bel. Not sure why the last l is dropped but there it is. For $6 it is a decent serving size and you could easily share these between two people. They are made to order and come out hot--props for that. They are described on the menu as Liege waffles which I will contest a bit as those usually have bits of chunk sugar in them to make them more dessert like and these did not. As for taste, they didn't really have the red velvet flavor, meaning the chocolate undertones since it really is just chocolate and red food color. I could tell there was some brownness in there but it tasted like a plain old waffle. Kicking up the chocolate flavor would help taste and also give a bit more of a dark red coloring like velvet too. I will say the cream cheese frosting side was actually pretty good. Whipped up and not too thick it had the tang of cream cheese with a sweetness that wasn't overwhelming. And while I know (and we all know) I could eat a lot more of it, there is enough to spread across the four slices you do get. I think with a tweak of more chocolate and bits of sugar like a Liege, this could be super. As is, it's 'awright. The crab cakes and red velvet waffle weren't wow you gotta try them, but they weren't terrible either. I know that isn't a ringing endorsement, but I can't really give one based on what I had. Maybe if I'd had some of their coffee they would have been better? Doubtful though. Crab cakes and waffles aren't really a thing, yet, or at least in this instance, not from SPRO Coffee. But hey, at least all my food this time was totally brown! Another trend I'm trying to break out of, slowly.